Did you know you can damage your hearing even if you are wearing the best hearing protection available? Well, have you ever heard of concussion (or concussive) hearing loss? There is no amount of anything you can put in or over your ears to protect you from concussion loss. My audiologist explained to me the concussion comes through the facial bone structure and damages the ear’s tiny bones. Editor’s NOTE: This may be the most important tech article we’ve run all year. It explains how you can suffer inner ear damage and hearing loss even if you use earplugs or muffs. Read that again — hearing loss even with typical hearing protection. 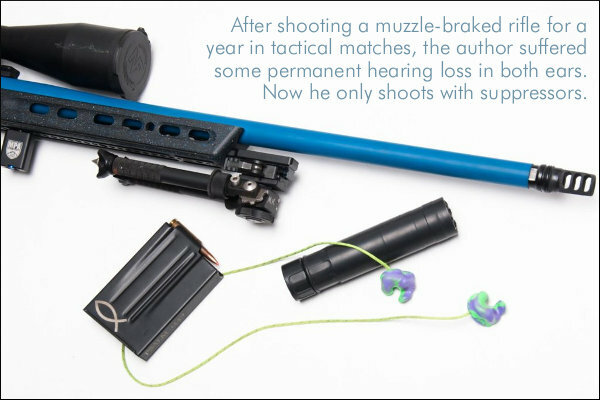 This kind of concussive hearing loss can result from shooting with muzzle brakes in confined spaces. 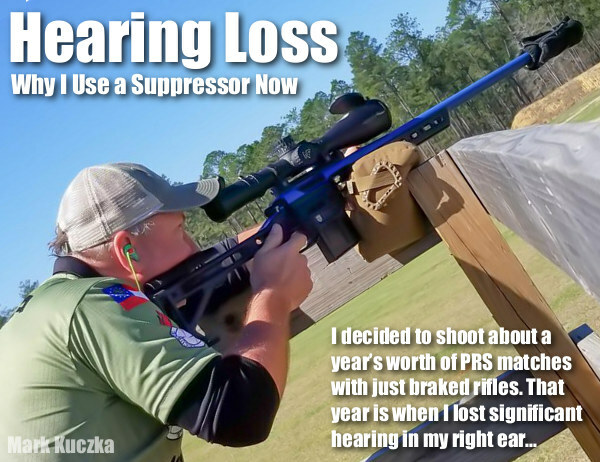 Using a suppressor (aka sound moderator) can reduce the risk of concussive hearing loss. 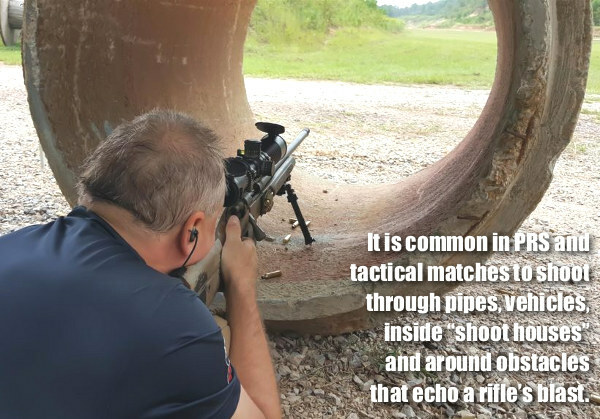 You may not have the ability to use a suppressor, but this article explains how you should be more mindful of your hearing. I decided to shoot about a year’s worth of matches with just braked rifles. That year is when I lost significant hearing in my right ear and some in the left. I’ve gone back to shooting only suppressed rifles whenever possible. Did you know you can damage your hearing even if you are wearing the best hearing protection available? You’ve heard guys say, “I’ll wear plugs and muffs, so I’ll be just fine shooting that .50 BMG!” Well, ever heard of concussion (or concussive) hearing loss? Yeah, I hadn’t either. I’ll sum it up the way the last audiologist I spoke with about my hearing loss did – there is no amount of anything you can put in or over your ears to protect you from concussion loss. Let me stop here and say I am NOT anti-brake. Muzzle brakes are useful tools and for some situations are the best tools. An aggressive brake can be more effective at reducing recoil than a good suppressor. A suppressor does add some recoil reduction, just not as much as most quality brakes. Don’t forget to factor other variables, such as caliber and rifle weight, into the equation though. For example, a 15-lb 6mm Creedmoor rifle doesn’t need much recoil reduction in the first place. Okay, so I have hearing loss that I can’t get back and realize I need to go back to shooting matches with a suppressor. But which one? I’ll still be shooting matches with custom fit plugs so I just need something to add a little recoil reduction and kill that concussion. At our shop, Accurate Ordnance, we generally recommend direct-thread suppressor solutions to our customers. The main reason for that is all the problems we’ve seen with other fast-attach muzzle devices. It doesn’t take much tolerance stacking to result in accuracy issues. There are a few exceptions for us and the Rugged Suppressors products top the list. 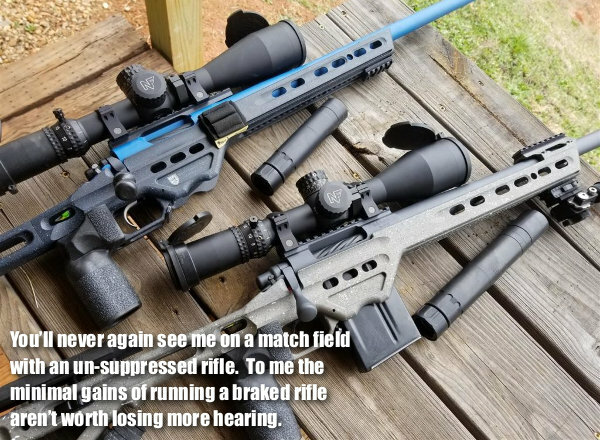 Since the Razor 762 uses a muzzle brake adapter on the rifle to attach the suppressor, I can use the same suppressor on my .223 Rem training rifle. My primary match rifles are chambered in 6mm Creedmoor and 6.5 Creedmoor and the muzzle threads on those is a standard 5/8×24. My .223 Rem training rifle has .5×28 threads on the muzzle, which is standard for that caliber. Thus, the muzzle adapter interface lets me share the suppressors between all the rifles. And on that .223 Rem training rifle I have the option of switching the end cap on any of the Rugged products to a .223 aperture size, which makes the suppressors slightly more sound efficient (meaning quieter). Share the post "Don’t Go Deaf — Understand Risks of Concussive Hearing Loss"
Running out of space in your gun safe? Here’s a clever product that will allow you to store more long guns in your current vault. The plastic Rifle Rods from Gun Storage Solutions slip in long-gun barrels and then grip the shelf above using Velcro pads. This allows you to nestle your rifles and shotguns much closer together than with the conventional racks provided with most gunsafes. The rods are offered in bright orange or basic black. We prefer the safety orange rods (shown above with the Velcro “receiver” shelf liner provided with the Rod Kit). Rifles with narrow furniture (such as lever guns) can be placed very close together, saving lots of space. For benchrest or varmint rifles with wider fore-ends, you won’t benefit as much. Note that, in the photo above, all of the guns are fairly slim — none have wide fore-ends. Still we think these Rifle Rods could open up 12″ or more horizontal clearance in a medium-sized safe — that could easily allow you to store six (6) more guns in two rows, as shown. A kit with 10 Rifle Rods and loop fabric shelf liner costs $34.50 on Amazon.com, while the 20-Rod Kit with liner costs arond $55.00. That’s a lot cheaper than buying a new safe. A six-pack of additional black Rifle Rods costs $15.25 on Amazon. 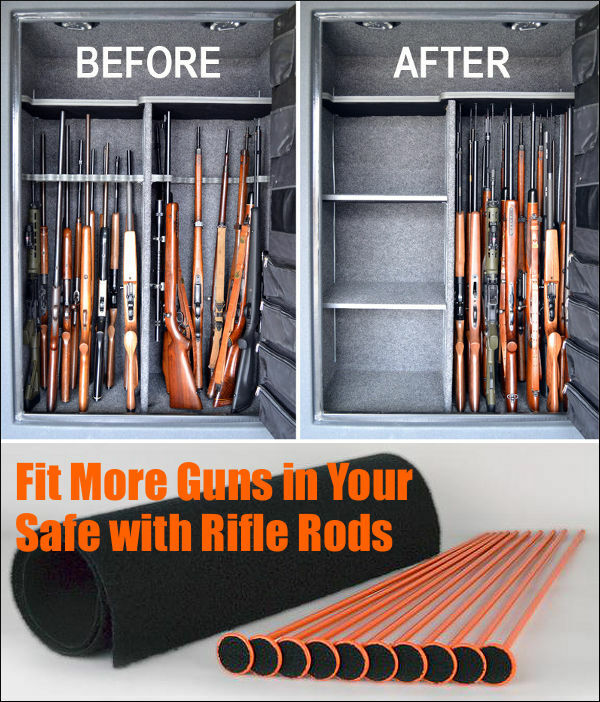 NOTE: To get the safety orange rods you may have to pay a few dollars more and order directly from Gun Storage Solutions. WARNING: Always REMOVE Rod from barrel before taking gun to the range. Never place live ammunition in a gun with storage Rod in the barrel! 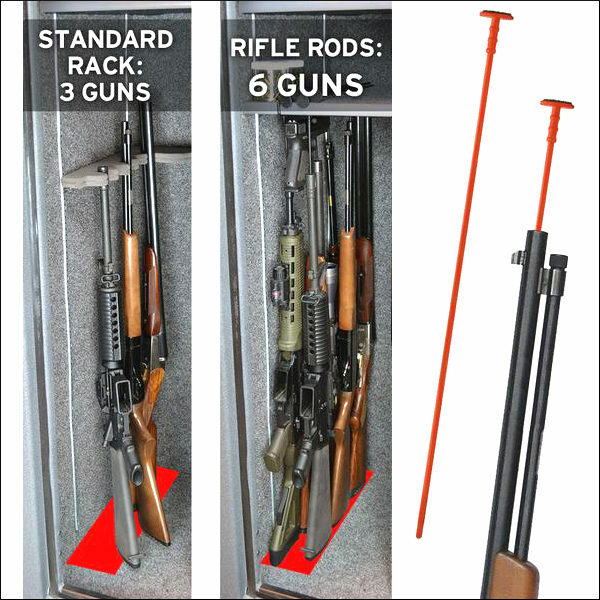 Share the post "Store More Guns in Your Safe with Rifle Rod Kits"